As a hopeless romantic, I can't help grinning with satisfaction when a good love story ends with a wedding! It is rather ironic, then, that my favorite romantic story, North and South, contains no such traditional conclusion. Although Gaskell meticulously describes all the heart-pounding moments that lead up to John and Margaret's discovery of their mutual feelings, she leaves us to imagine for ourselves all the complications that will be involved in arranging the marriage between the London heiress and the former master of Marlborough Mills. Is there anyone who hasn't imagined something of the scenes to follow that abrupt ending? 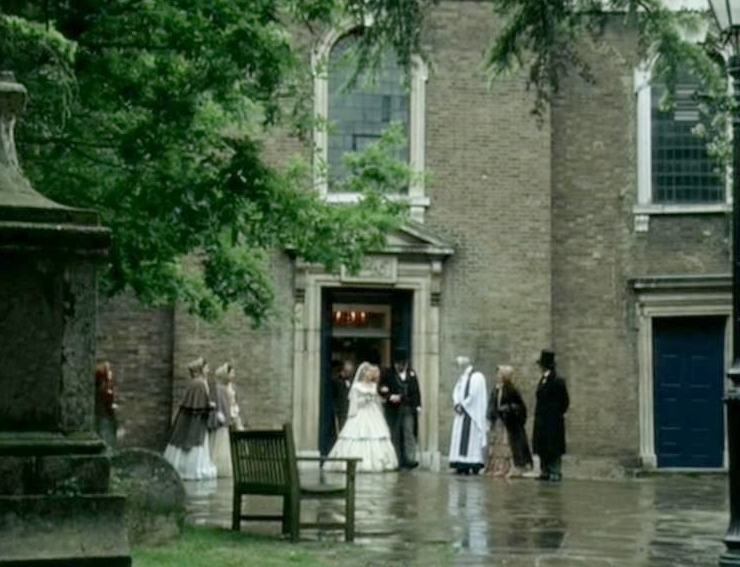 From the BBC adaptation, Fanny gets married. This church is St John at Hampstead (north London). I can't think of a fan fiction story that doesn't have them marry fairly quickly. And that seems entirely natural since both these individuals are passionate and decisive. Neither of them will care about whether or not the wedding is elaborate. According to the span of events in the book (see my N&S timeline here), by the time these two lonely souls come to an understanding, two whole years have passed since John first proposed to Margaret! After such a lengthy and angst-ridden separation on both their parts, I cannot fathom them waiting any longer than a month to arrange a wedding. They could wait three weeks for the banns to be read at Margaret's parish or John could purchase a special license to let them marry even earlier. I'm certain John would prefer the latter! Most fan fiction weddings, however, happen in Milton. And this is where things get a little more tricky. Margaret is no longer member of a parish there, and we know that John is not Church of England. So do they marry in John's church? [Gaskell is purposely vague about what church the Thorntons might attend, although she does throw in that Mrs. Thornton studies a Presbyterian Bible commentary, Matthew Henry's Commentaries.] Since both John and Margaret are devout Christians, a civil ceremony would feel incomplete. There are many versions of John and Margaret's wedding in Milton. The Mistress of Marlborough Mills and True North (both at C19) have Milton weddings. Elaine Owen's Common Ground and Nancy Klein's How Far the World Will Bend also have Milton weddings, although the circumstances behind each are entirely different! I enjoyed creating an entirely different wedding scene in A Heart for Milton by having them marry in Helstone. I wanted Margaret to marry in her childhood home, where her father had been vicar for so many years. And of course I couldn't resist the romantic country setting. I'm not sure there are any other variations that have the wedding take place in Helstone. Although I haven't read it yet, I'm told Nicole Clarkston's No Such Thing as Luck has neither a London, Milton nor a Helstone wedding! You'll have to read it to find out all about this unique wedding scene. Tell me your thoughts on John and Margaret's wedding, and share you favorite fan fiction weddings! Older PostWas John Thornton a "Mama's Boy"?